Users can quickly build any SELECT statements containing multiple tables, joins, conditions, and subqueries without typing any code. The state-of-art diagram visually presents all the elements of the query. 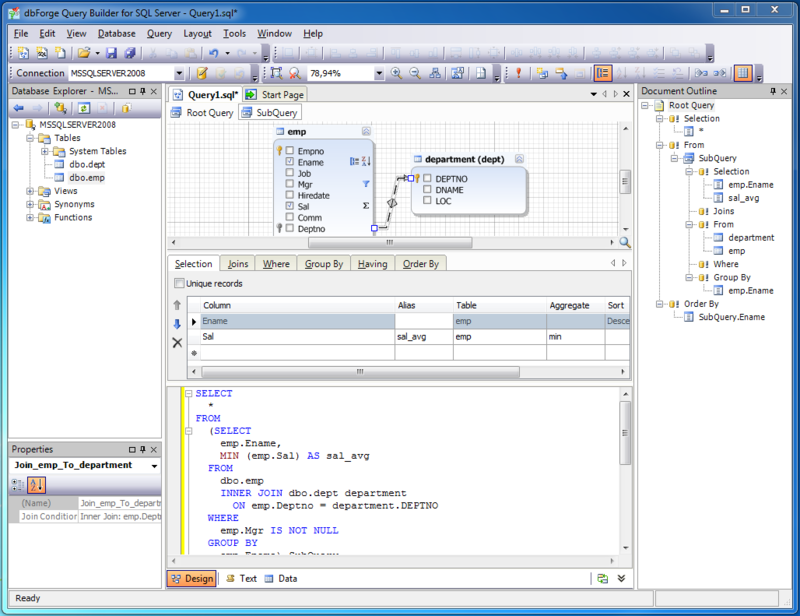 Tables can be quickly added to a query via drag-and-dropping. Using the powerful expression editor, the user can effortlessly control columns, aliases, and functions in one place, set composite WHERE and HAVING conditions, and quickly change grouping and ordering. The queries can be saved to a file. dbForge Query Builder gives new experiences to analyze and process received data efficiently. To get better insight into the query results, the users can group, filter, and sort data in the grid, view data rows as neat cards, print the selected data, display large bulks of data in the paginal mode, and work with binary and long text data fields using LOB (Large Object) windows. The auto-search mode can save hours of precious time spent on finding the required data. Quick control of the data update process is guaranteed with both cached and write-through update modes, and connection-level transactions. Customers can download a free 30-day trial version and check the tool with own databases. Devart development team is looking forward to any comments and suggestions at dbForge Query Builder feedback page. Learn how to use SQL Query Builder with the help of short videos here.